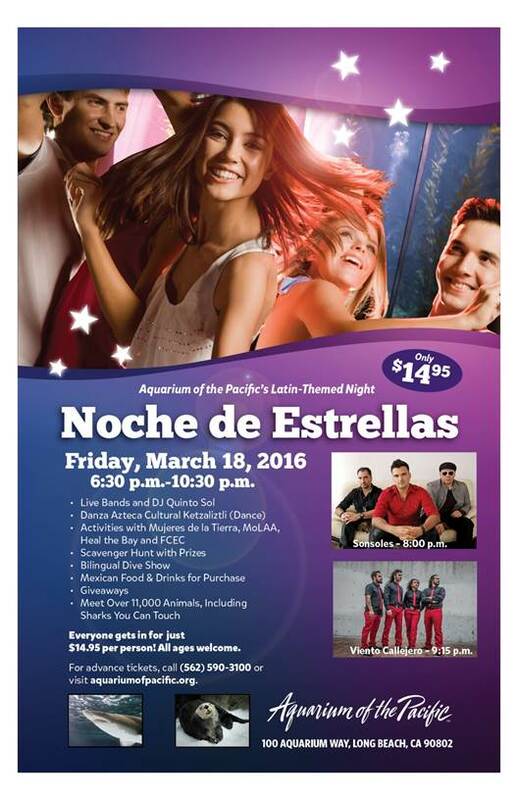 WHAT: Guests can party with the sea stars and learn about marine life and the environment at the Aquarium of the Pacific’s all-ages Latin-themed Late Night on Friday, March 18, 2016, from 6:30 p.m. to 10:30 p.m. The Aquarium will remain open past normal operating hours so guests can dance to the sounds of cumbia, rock en Español, salsa, and other Latin rhythms with the live bands Sonsoles and Viento Callejero. 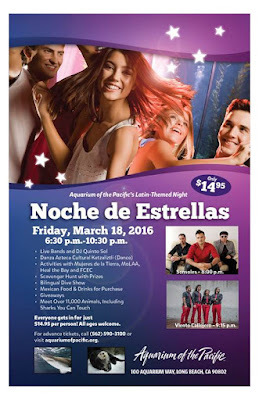 The Noche de Estrellas (Night of the Stars) event will feature Aztec dance with Danza Azteca Cultural Ketzaliztli, crafts with the Museum of Latin American art, and bilingual educational programs, including an underwater SCUBA diving show, scavenger hunt with prizes, ocean-related activities, environmental activities with Mujeres de La Tierra, Heal the Bay, and Fish Contamination Education Collaborative—all offered in both English and Spanish. The event will also feature special programming highlighting the world’s smallest and most critically endangered whale, the vaquita marina. Mexican cuisine, beers, wine, cocktails, and refreshments will also be available for guests to purchase. In addition to being immersed in Latin culture, guests can journey through the Pacific Ocean to meet over 11,000 animals at the Aquarium, including animals they can touch from sharks and rays to horseshoe crabs. Please note: The Lorikeet Forest aviary closes at 4:30 p.m.
People can enjoy the ambiance of the Aquarium at night and this all-ages event for $14.95 per person. WHEN: Friday, March 18, 2016, 6:30 p.m.-10:30 p.m.
AQUARIUM: The nonprofit Aquarium of the Pacific is a community gathering place where diverse cultures and the arts are celebrated and where important challenges facing our planet are explored by scientists, policymakers, and stakeholders in search of sustainable solutions. The Aquarium is dedicated to conserving and building nature and nature's services by building the interactions between and among peoples. Home to more than 11,000 animals, the Aquarium also offers educational programs for people of all ages, from hands-on activities to lectures by leading scientists. The Aquarium has won a 2015 Travelers' Choice Award for Aquariums, as awarded by TripAdvisor® travelers. The Aquarium offers memberships with unlimited FREE admission for 12 months, VIP Entrance, and other special benefits.